The following press release comes directly from the Franciacorta Consortium. For a list of Milan restaurants that will be participating (September 11-18) in related events, please click here. Put the Franciacorta Wine Festival on your agenda this September! 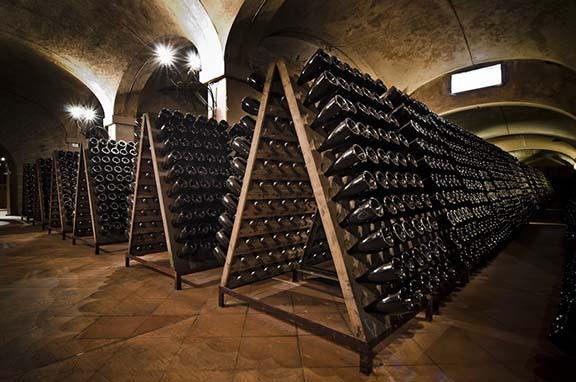 Erbusco, 1 September 2015 – Franciacorta will be front and center this September. Tourists and wine lovers alike can write the dates of the September cult kermesse in their agendas: the Franciacorta Wine Festival is scheduled for 19 and 20 September. This year, in synergy with Expo 2015, there is an additional treat: Anticipating the Festival, from the 11th to the 18th of September: the wine cellars will organize – in various wine shops and restaurants in Lombardy, happy hours, tastings and dinners in combination with Franciacorta wines. A way of leading up to the Festival, on the following weekend, and to whet the appetites of the final consumers and wine aficionados. The calendar of events leads off with “Franciacorta ad Astino”, Thursday 10 September from 7 p.m., first among all the events planned for Anticipating Franciacorta and the Franciacorta Wine Festival, which will be held in the splendid setting of the Monastery of Astino. Immersed in a small valley just outside the city of Bergamo, this jewel was first built almost a thousand years ago, and is striking for its layers of beauty, each added during a different period. After years of neglect and the restoration insistently pushed for by the Fondazione Mia, the current owner of the property, the monastery was re-opened to the public on the occasion of Expo Milano 2015. It is a unique cultural asset, which intends to recapture some of its ancient splendor by serving as the perfect setting for a combination of art, culture, agriculture and food. In this context, an exhibit was organized dedicated to Gino Veronelli, a prominent figure in Italian cultural circles: publisher, journalist, enologist and gastronome, he was active in the second half of the past century, a time that witnessed profound changes in the society and economy of our country, especially in the agrifood sector. “Luigi Veronelli – Camminare la terra” [Lugi Veronelli: Walking the Land], sponsored by the Comitato Decennale Luigi Veronelli and the Milan Triennale, is open from May 21 to October 31, 2015, at the Complesso Monumentale di Astino, in Bergamo. During the evening of 10 September, the splendid cloister will be the setting for three tasting clusters, featuring three different types of Franciacorta wine: Brut, Satèn and Rosé, served in combination with matching gastronomic treats. The event will be enlivened by the music of Gezzz4tet, led by Pietro Bonelli (www.pietrobonelli.it). Tickets to participate in the “Franciacorta ad Astino” event are available at http://site.astinoexpo2015.it/ristorazione/65_franciacorta-in-astino. Click on the Prenota button to make a reservation. The cost for the evening is 20€ per person, and includes 5 glasses of Franciacorta and a complementary glass and pouch. The Franciacorta Wine Festival is scheduled for Saturday 19 and Sunday 20 September, when the heart of the Franciacorta area and its wine cellars will be open to visitors: 68 wineries are organizing events linked to the themes of wine, food, culture, sports and art. A weekend in which visitors can take advantage of the opportunities to follow the Strada del Franciacorta, a route rich in places of interest from a historical and artistic standpoint: castles, monasteries and museums. Nature lovers will have a chance to stroll through the vineyards, led by agronomists, or follow one of the trekking routes through the hills, on foot or on a mountain bike. Basically, a relaxing weekend designed for wine lovers, tourists and everyone who likes to get out in the country now and then. By clicking on the official website – www.festivalfranciacorta.it – you can check the events offered by each winery, admission costs and reservations. Reservations must be made directly with the winery in question. Unless otherwise indicated, wine cellars will be open from 10 a.m. to 1 p.m. and from 2 p.m. to 7 p.m.